From wading thru the marketing bee-ess I assume this gadget 'fools' the mass air flow sensor into more or less available air and likewise pours in more/less fuel. 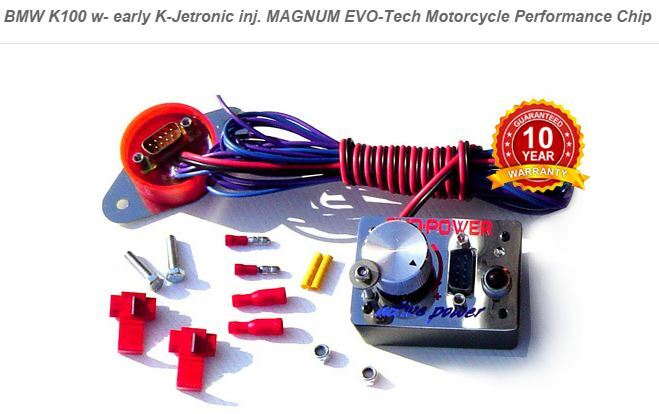 Can't find a review from a K-biker (surprise) and anyway reviews on sites like this can be, er, less than genuine. An adjustment knob? Seems a bit archaic. K-Jetronic? I have never heard of that one on K bikes. Early K's were L-Jetronic, and they switched to Motronic on 4v bikes. I would be very leary. @KafeRacer wrote: K-Jetronic? I have never heard of that one on K bikes. Early K's were L-Jetronic, and they switched to Motronic on 4v bikes. It's not a K-Jetronic it's an Early K L-Jetronic. They cant be very good because there isn't much you can do except rich-lean in the barn door and move the rev limiter up a bit but for that to work they need more air. The rev limiter is in the ignition unit so it cant be that. They're obviously mistaken so let's take the piss out of 'em further. The stuff people try to pawn off on unsuspecting buyers on eBay and other sites. Sheesh. 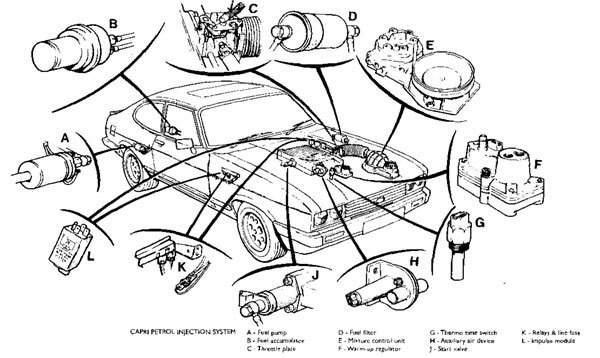 My late '70s VW Rabbit/Golf/Sciroccos had K-Jetronic, a mechanical plunger with a fuel distributor with hoses to each non-electrically pulsed injector. It was a mess, plumbing-wise, though it ran and ran and was easy to set up if you could sniff the mix out of the tailpipe with a handy analyser. Here's a component count - on a Ford V6. As you can see there wouldn't have been the room for it on a K Bike. Thanks, everyone. Love reading your replies. The site reeked of snake oil, I'll admit.